Hi all and hope your having a good day. I have been having one problem after the other with my Lincoln. Started 2 months ago with a blown head gasket then the coil went out along with the condensers, got all that fixed and the belt broke and while putting it back together and tightening up the slingshot for the Alternator the front of the edelbrock 2x2 intake manifold broke off about 2" back. Glad I kept a single 2bbl intake. I have a machinest friend cutting it back and CNCing a whole new front end and tigging it back together. Sure hope to not have any more problems this month. Damn! today I drained the oil and nothing but water, I think I have a cracked block too. I think its time to make a hot rod Lincoln with that new 429 I have sitting on a stand. At least keep it all ford products. 1. You could have a leak related to the head gasket. 2. Before pulling the block, you should at least try something like Irontite block sealer, which might seal smaller cracks. It's at least worth a shot. If none of the spark plugs were "wet" then maybe the problem is at the lower end? One or more of those casting plugs on the bottom rail ( where the pan bolts to) may be the culprit especially if there was a lot of water in the oil pan. Removing the pan for a look-see might be worthwhile as you can also check the block. You might get away without pulling the engine if it's just one of those rail plugs. Good luck. That's a really good idea, Peecher. I guess the point is that there are a lot of ways that water could be getting in there without it being such a catastropic problem that the engine has to come out. I also wonder how many of these older blocks have started to develop minor waterjacket cracks after 60+ years? If the casting plugs *do* have to come out, I might even suggest flushing the coolant system at the time just to see what gunk is caught up behind those plugs. Thanks for the help guys. I have had both heads off and the intake and no sign of water anywhere. it does seem to hold water for a day or two then it all ends up in the oil pan. I will have to pull the pan and check those plugs. Thanks Peecher I forgot all about those. The engine has had the coolant flushed every year since it was rebuilt and oil changes every 1000 miles. it has been sitting in the garage for the last year without running except for once every other month while I am working on my 69 Dodge Daytona. Guess its a jelous car. I will pull the pan in the next few weeks and let you guys know what I find. I hope its as simple as a core plug. If it is I think I might tap them and put screw in type plugs in there. I will tell you what bad luck is! On Wednesday I was testing my power windows on my 46 sedan. I had removed all of the interior except the back of the front seat. I had rebuilt the two front window lifts and put in new hoses for the back but did not hook them to the lifts. I was testing the electric switches. The front seat back was laying down on the floor in back. When I pressed the switch an unbeliveable amount of oil squirted on the seats from the two rear hoses. I am now testing all the sport remover products I can find. Ihave about 95% of the oil removed. Any good spot removers out there. Thanks for reading my tale of woe. Buy a can of 3m adhesive remover, spray it on a cotton cloth and blot out the oil stains. I use it all the time for grease on interiors. When it dries, there is zero odor. Test a small area 1st to make sure it doesn't pull the color from the fabric. It works great!! I dropped the oil pan and found the crack. its right where the center water jacket plug is, it was welded up there when I had the block machined and apparently not welded up good enough, water is leaking from both sides of the weld. Time to pull it and get it done right which means disassembling the whole engine for a little crack. I Love this car but sure wish they had Packard build thier engines, never have any problems with my Packards. I'd *really* think about using something like Irontite first, prior to pulling the engine, but of course, the choice is yours. 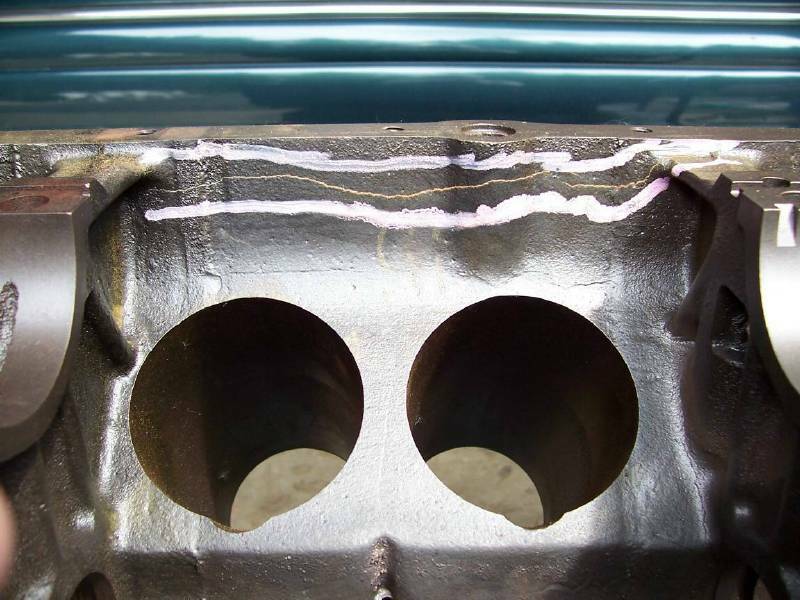 If you do pull the engine you might want to consider having that crack "pinned" ( rather than re-welded) and then follow up with some block seal when you get ready to run it again. I had a V 12 block with a ( horizontal) crack in the same location and opted for this procedure. The "pinning" procedure requires some "art" but I imagine that there are places/people in California that are good at this. Good luck. Here are a couple of pics of the repair. Glad to see the site back up. Thanks CBoz but once this is back together I want it a permanet fix. I am thinking about tapping the water jacket and putting a long brass plug in there maybe an 1 1/2" long so its past the crack and insure no more water will leak. I just need to know if the water jackets are the same diameter from the bottom up so the threads will hold at least past the crack. I will find out next week if I dont hear from anyone here. I'm not sure that a plug will solve your cracked block problems. If you look at the pictures above that Peecher submitted, his crack was long and horizontal. I have rebuilt a couple of these engines and I believe that the water jacket runs the length of the block with about 7 freeze plugs in the bottom rail. Usually this portion of the water jacket is filled with sand and rust from the original casting process and age. I was looking at a site on stitching cracked blocks and they do NOT recommend welding cracked blocks. They have a tendency to crack again on each side of the weld caused by the heat of welding and a fast cool down. 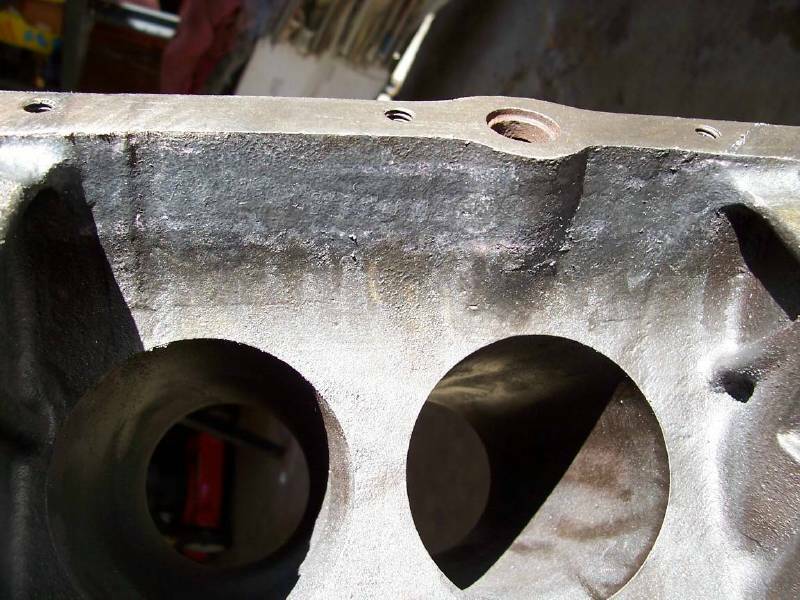 Find a machine shop that will stitch the block and ask if the engine has to be stripped to the bare block. Maybe they can work on it with the crank and pistons in place. Only reason I am thinking of putting a plug in it is the crack is only 2" long at the bottom and just 1/2"high so its not to bad, just bad enough to leak water in my oil after sitting for a day or two. I am rebuilding an engine for a member of LZOC Harold 1938 Zephyr from Tucson and after removing the oil pan it had the same crack on the edge like you are showing. If you have a freeze plug leaking you will know as it would leak on the ground. I had to get a new block from Merv Atkins in Pomona. Mine leaks in the oil pan, the crack is on the inside not the outside. I will be pulling the engine this winter and getting it fixed properly. until then I will keep my eyes open for a good V12 block. Good time to have my cam reground since it will be all apart. Merv Adkins (Pomona, CA) is a lot closer! He had a bunch of V-12 blocks a couple of years ago, and probably still has them.